APPLICATIONS: Designed to fits structural and architectural metal roof systems with standing seams up to 1/2" (0.516") thick and at least 1-1/2" high, including snap-lock interlocking panels. 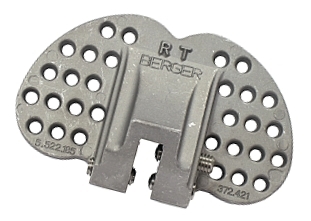 Berger AP series snow guards are non-penetrating devices which are secured to the standing seams of metal roofs utilizing stainless steel set screws to clamp them in place. Aluminum snow guards are not recommended for use on copper roofs (use bronze or copper). AP Snow Guards are available two sizes to accommodate differing seam widths. OPTIONS: Available in mill finish cast aluminum, medium gloss black epoxy primer finish, and custom painted (3 week lead time, special order non-returnable item).